If two surfaces separate it requires work to pull them apart. When the forces are due to surface energy, this work is labelled W, the Work of Adhesion. In general W is trivially small, less than 0.1J/m2, making it useless for most adhesive purposes. In other words, surface energy is largely irrelevant for practical adhesion unless you are a gecko. 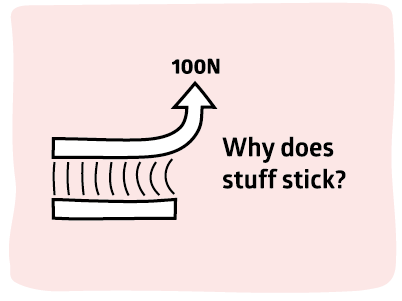 When the forces are more powerful we talk of G rather than W. For a typical "good" adhesive, G~100J/m2, i.e. 1000x larger than the adhesion from surface energy. 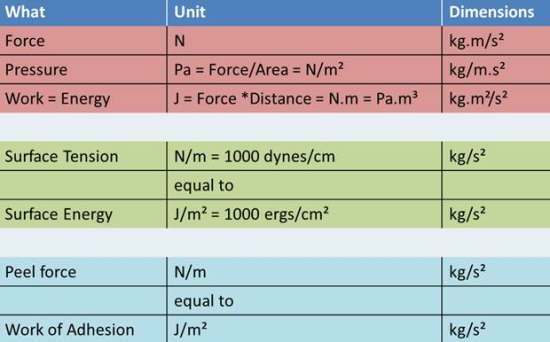 One aim of this guide is to make it easy for you to understand what takes you from 0.1J/m2 to 100J/m2. The difference between W and G is sometimes called "adhesion hysteresis". This makes sense when the differences are modest (0.1-0.5J/m2) but the term isn't helpful for "real" adhesion when the W is a negligible part of the overall effect. For simplicity, whether we have W or G, the calculated value shown in the modeller is always referred to as Work of Adhesion in J/m2. In fact, according to basic theory, for a 90° pull, P=W but for a 180° pull W=2P [W=P*(1-cosθ)]. Everyone knows that there are two types of failure of an adhesive bond: adhesive and cohesive. 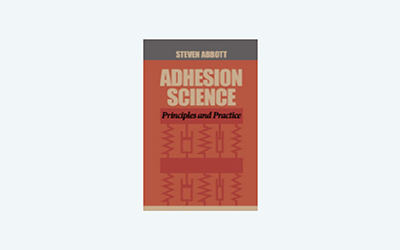 To give away one of the key ideas of Practical Adhesives, it's useful to introduce a third type of failure which I will informally call real adhesion. 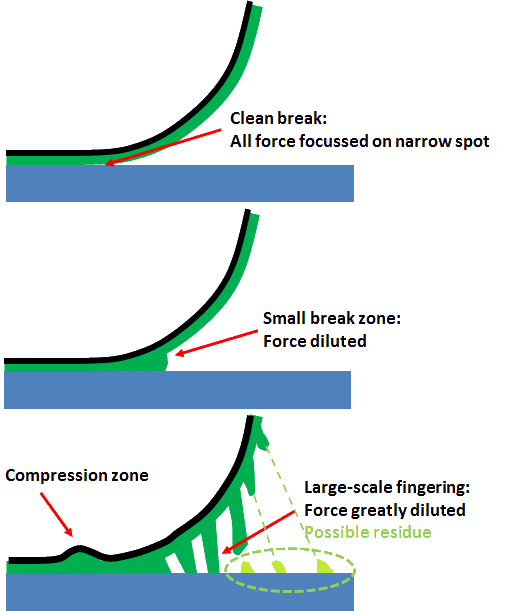 In adhesive failure, there is simple crack propagation along the interface. This is what you get with pure, but useless, surface energy adhesion. In cohesive failure the adhesive itself is the weak link. Note (and this is important for PSA) that there is probably a lot of stretching (µm or mm) and general absorption of energy which makes the failure of even a weak adhesive much stronger than one might expect. Real adhesion arises when the interface has a chance to stretch over a few nm. This reduces the force per unit area and greatly reduces the chances of the crack propagating. In other words, to get good adhesion you have to spread the task over many molecules via entanglement or (it comes to the same thing) cross-linking. Note that just a line of chemical bonds along the interface cannot do this sort of spreading so chemical bonds on their own are rather ineffective. These are discussed further under Testing.